Here’s a Summer Reading List that includes our family’s favorite books for kindergarteners. Since all children are different, your child may have a different tolerance for longer stories. Here are some gems that will delight most children who are not yet reading independently. Recently, I shared some favorite books with a customer who wanted a Summer Reading List for a five-year-old. Now that school has let out, I’m sharing these treasured titles with all of you since I get so many requests for ideas. Reading every evening as part of the bedtime routine makes for such wonderful interactions. The books listed here are enjoyable for adults as well as children, and provide rich artwork to nourish the soul. Click the headings or photos to learn more! Laura Engalls Wilder’s adaptations enthrall young children with tales of summer days in the Big Woods, moving to the Kansas Prairie, and Almanzo’s prize pumpkin. Sophie lives in the city, and her vegetables come from the supermarket. Then she goes to visit her grandparents in the countryside and soon discovers how much there is to learn about how things grow! This is a wonderful book for children to learn about allotment or vegetable gardening though Sophie’s eager and questioning eyes. For me, the Elsa Beskow books are a classic. They are bound beautifully I have met several families that consider them keepsakes to be handed down through the generations. Her spring/summer themed stories include: Pelle’s New Suit (4+), Emily and Daisy (5+), The Sun Egg (5+), and The Flower Festival (6+). The flowers invite Lisa to The Flower’s Festival. The Midsummer fairy drops some poppy-juice into Lisa’s eyes to make her invisible. At the top of the garden, Queen Rose sits on her throne welcoming all the guests, surrounded by her colorful court! Big Mama sends Flossie Finley on an errand with a warning. Beware – there’s a sly, egg-poaching fox on the loose! 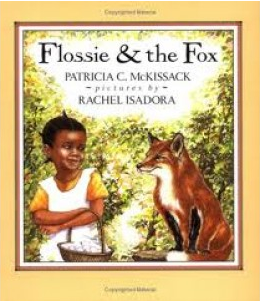 This cute Southern folktale is peppered with saucy wit and humor. I love these because there are 20 stories in each book. Click above to check out the Japanese artwork. Each book features memorable stories and characters such as singing turtles, flying farmers, a dragon that weeps, fairy cranes, and more! A unique and charming read-aloud tale with engaging illustrations that introduce children to the flowers in the butterfly kingdom. This Silbylee von Olfers tale invites readers to experience the metamorphosis of ushering in spring. The children can’t wait to finally get their wings. But first, they must learn about the many brightly-colored flowers in the kingdom! Roxaboxen appeared to be nothing but sand and rocks, some old wooden boxes, cactus and greasewood, but it was really a sparkling world of jeweled homes, streets edged with the whitest stones, and two ice cream shops. All children need to go to Roxaboxen is a long stick and a soaring imagination.This story is illustrated by Barbara Cooney (familiar to lovers of Miss Rumphius). Roxaboxen appeared to be nothing but sand and rocks, some old wooden boxes, cactus and greasewood and thorny ocotillo. But it was really a sparkling world of jeweled homes, streets edged with the whitest stones, and two ice cream shops. All the children needed to go to Roxaboxen was a long stick and a soaring imagination. Tomie DePaola’s treasured artwork embellishes this sweet story about how an unselfish girl gives from her heart so the tribe can benefit. Daniela Drescher has written/illustrated many books. Most of them feature darkly rich colors, but this one adds brightness for summer. Click the title and feed your imagination… Faith the fairy needs a dress for Queen Wren’s meadow party, and the moon helps her out! We have so many favorites, the list could go on and on! What books does your five-year-old love hearing again and again? Please share in the comments here and on our Facebook page!